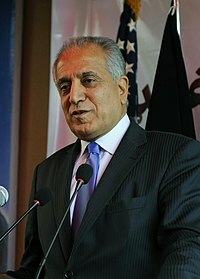 Zalmay Mamozy Khalilzad (Pashto: زلمی خلیلزاد Zalmay Khalīlzād; born March 22, 1951) is a counselor at the Center for Strategic and International Studies (CSIS) and president of Khalilzad Associates. He was the United States Ambassador to the United Nations under President George W. Bush from 2007 to 2009. ↑ Zalmay Khalilzad: US power broker BBC. 2007-01-08. Retrieved on November 1, 2009. This page was last changed on 31 August 2017, at 15:21.